Why use ConX for Take Offs? ConX is the only end-to-end platform that allows you to get cheap & reliable BOQ's, send professional-looking quotes, and manage all your leads in one place. 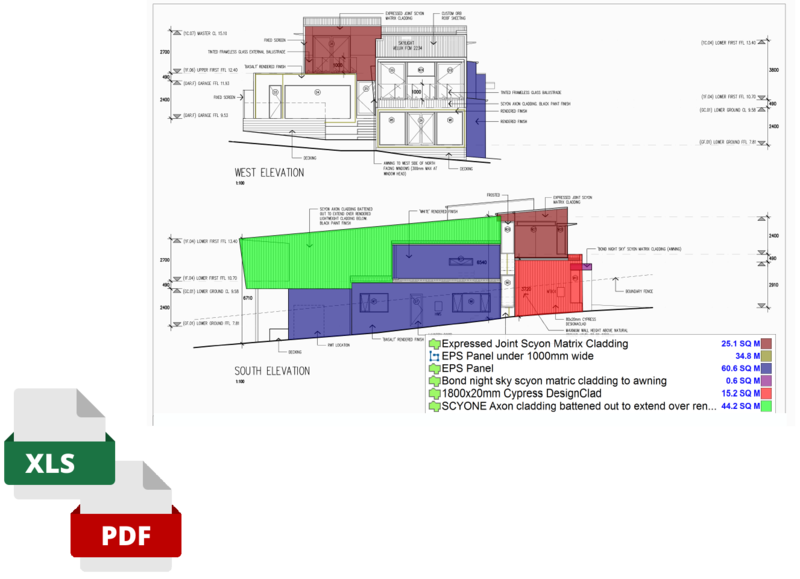 We rely on professional estimators using CAD and BIM, who have already done BOQ's for 100's of winning tenders. We are confident that you will be satisfied. If you have an issue and we cannot resolve it, you will be fully reimbursed. After you accept the quote, we will return the finalised BOQ within 5 working days to allow you to quote faster. ConX is the leading marketplace for the industry. By using us, you'll gain an online profile to promote your business. A lot of Builders are using ConX to post tenders! By joining our network, you'll be notified when new opportunities appear. Speak to our team with any questions you might have, on the phone during working hours or on live chat on the website. Your sample BOQ has downloaded successfully. If downloading from a mobile, we've emailed the sample directly to you. Upload plans with a scope of works for the job and we will provide a quote the same day. Whether you just want the material take off done or your would like us to include estimates for what the labour and materials will cost we can work to your specifications. Provided you are happy to proceed we will supply a complete Bill Of Quantities with marked up plans in 5 business days from receipt of payment. What's the difference between Bill of Quantities, Bill of Materials or Takeoffs? They are all the same thing, some people just call them by different names. Takeoffs tend to just refer to the materials and quantities and dont have estimate costs involved. But we will work with you to make sure that everything is to the scope and spec that you want to see it returned. How long does it take to get my completed Bill Of Materials? Our building cost estimators can return the complete Bill of Materials in 5 working days. For some commercial projects the estimates may take longer but a turnaround time will be agreed in advance. For single trade packages (plumbing, bricklaying, electrical, etc) they start at $350, the more complex jobs take longer and the price will reflect that. For multi-trade packages an elemental Bill of Quantities starts at $700 and a detailed Bill of Quantities starts at $1,000 and varies depending on level of detail and size of project. What is the difference between an Elemental and Detailed Bill Of Quantity? A detailed trade BOQ is a complete breakdown of all of the trades, the items and quantities involved for each trade, best used for the builder for construction purposes but can also be used in the tendering phase if necessary. An elemental BOQ is a high level overview, taking all factors into account. We base it off the m2 of floor area, for example, take a wall, if we give a price per square meter, within that price we will factor in all elements of the wall like frame, insulation, plasterboard, paint, etc. This can be used when discussing costs with clients or if the construction drawings have not been finalised. Everyone. Whether or not you are a carpentry subcontractor looking to get a quote in for a residential job or your estimating team is under the pump and you need someone to provide the BOQ for a multi residential project, We can complete professional Bill of Materials in a timely manner that will allow you to quote with confidence and win more work. All over. We have completed Takeoffs for companies in Australia, the United States and Britain. And that's just the start, we are happy to look at your plans no matter where you are.